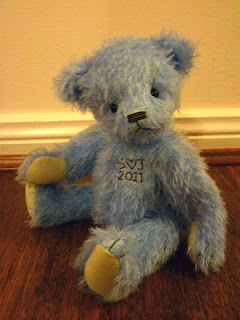 This is a commision bear of Valentine's Day 2011. One of my customers who had ordered a bear from me about 7 years ago, found me at Facebook. He ordered this bear for her girlfriend just 3 weeks before Valentine's Day. It's a rush job, and he lives in USA, and I have to post this bear to him on time! 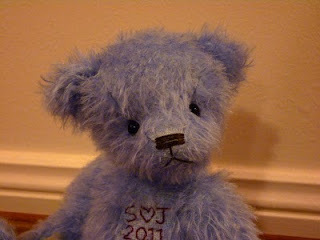 He only requests the bear has to have embrodiery of "S (heart) J 2011" on bear's chest. Luckily I already had a bear that was pre-sew on, so I started work from that. And there he is! An Antique style Valentine's Day bear for Jane and Steve! Very sweet face, and a beautiful color. I love the embroidery he had done. What a romantic gift. 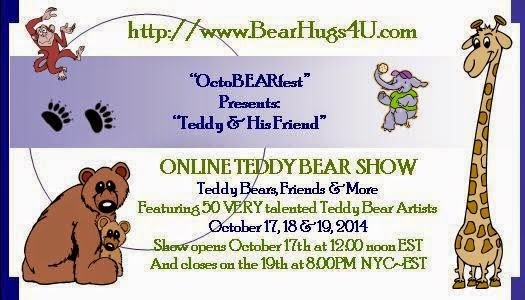 i love this one, Bonnie, seems he is a quite bear who was invited to talk.